ZzzQuil is a Brand name for an OTC antihistamine medication that contains diphenhydramine as an active ingredient. This drug reduced the natural levels of body histamine and thus relieves the symptoms such as: runny nose, sneezing, watery eyes, hives, itching, skin rash, and other cold or allergy symptoms. Diphenhydramine may be also used for the acute treatment of motion sickness, as a sleep inducer, and in rare cases to treat certain Parkinson’s disease symptoms such as tremor and muscle stiffness. It is available in the form of liquid capsules and liquid as a non-habiting forming diphenhydramine of 25 mg for short-term use. In General, the main ZzzQuil indication is the relief of occasional sleeplessness. This medicine product reduces the time to falling asleep in patients who have difficulty falling asleep. Usual adult dose for insomnia is 25 to 50 mg orally at bedtime. ZzzQuil’s active substance is antihistamine drug of ethanolamine class called diphenhydramine. It is a first generation antihistamine that passed through blood-brain barrier and causes sedation and has also significant antimuscarinic activity. Diphenhydramine works by competeting with free histamine in the body for binding at histamine HA-receptor binding sites. This action antagonizes the effects of histamine on its receptors, leading to a decline of the negative symptoms that high levels of endogenous histamine may cause. Diphenhydramine antagonizes histamine effects on HA-receptors in the GI tract, large blood vessels, uterus and bronchial muscle. Ethanolamine derivatives, in general, have greater anticholinergic effects comparing to other antihistamines and probably accounts for the diphenhydramine’s antidyskinetic effects. Central antimuscarinic effects may be responsible for its antiemetic effects, although the exact mechanism is still unknown. Patients should get emergency medical help immediately if they experience any of following signs and symptoms of an allergic reaction: hives; difficult breathing; swelling of face, lips, tongue, or throat. How fast does ZzzQuil work? An oral dose of ZzzQuil usually start working after 20-30 minutes, reaches maximum blood concentrations after 2 to 3 hours and the effects usually last for 4 to 6 hours. Many health professionals will suggest taking an oral dose of Bendryal about 30 minutes before bedtime, if the drug is being used as a sleep aid. How long does ZzzQuil stay in your system? A single dose of Diphenhydramine is active in the body for between four and six hours on average. The half-life time of diphenhydramine is about 8 hours in children to 17 hours in the elderly. In normal situations, this drug is metabolized in the liver and excreted through urine within approximately 24 hours. Can I give ZzzQuil to a dog? Diphenhydramine is one of the few over-the-counter drugs that veterinarians routinely have owners administer at home. It is generally well tolerated and has a wide safety margin. Some of its most common veterinary indications are the treatment of allergic reactions to insect bites or stings, environmental allergies and pre-treatment of vaccine reactions. It can be also used for the prevention of motion sickness in dogs and as a mild sedative. The standard dosage for oral ZzzQuil is 1 mg per pound of dogs body weight, given 2-3 times a day. Most drug store diphenhydramine tablets are 25 mg, which is the size used for a 25 pound dog. If pregnant or breast-feeding, patients should ask a doctor before use. Keep out of reach of children. Overdose warning: Taking more than directed can cause serious health problems. In case of overdose, patients should get medical help immedietely or contact a Poison Control Center right away. Many people suffer from sleeping disorders. When such individuals are going to bed, at night, they will know immediately that they will have trouble with sleeping. This is something that encourages them to find out a remedy in order to calm their nerves very quickly. This is why many patients reach for sleeping aids such as ZzzQuil products. This OTC medication is non-habit forming and is capable of proving a restful night’s sleep. Unfortunately, some individuals will attempt to abuse this medicine as a way for experiencing a euphoric feeling. During administration of this drug, it is possible for the consumer to experience some pleasant feelings; however these are just adverse effects of the ZzzQuil. These include dizziness and drowsiness. These are not pscychological effects of the drug. The experience is caused because diphenhydramine blocks acetylcholine in the brain, which is the neurotransmitter responsible for the motor coordination and muscles movement. Because of this, in some cases patients may experience that they are not able to walk easy and hard to verbalize anything, or to lose the will to do anything besides lying on the ground in a psychotic state of mind. This may also happen in patients who were using this drug, as a sleep aid. ZzzQuil is considered to be non-habit forming, there is no physical dependence but it is still possible to become psychologically addicted to it. It has been reported that large doses of diphenhydramine may cause psychosis and delirium effects in a higher rate than other hallucinogens such as LSD, ketamine or DMT. There are a large number of experience that are reported online which describe states of amnesia, psychotic delirium and other serious consequences after abusing thise drug. In many cases, it has resulted in hospitalization and death. It is very important to know that even a single dose of ZzzQuil can be in some cases very unpredictable and may have potential to result in severe consequences, hospitalization, coma or death. 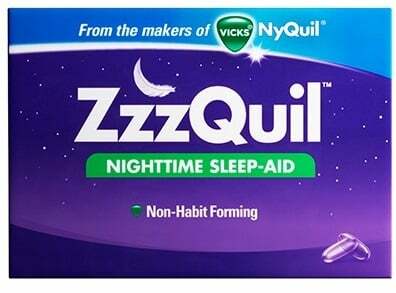 The toxicity and long-term effects of regular ZzzQuil administration has not been studied relevant and scientific fashion very-well, because chronic ZzzQuil administration is very rare occasion and the majority of people who uses this drug for a long-term do not wish to repeat the experience. If this drug is taken on a regular basis, there are reports suggesting that diphenhydramine may have some serious side effects on one’s kidneys with the potential to have side effects in bladder issues similar to that of ketamine cystitis. Sometimes, the signs and symptoms of a drug overdose may be difficult to notice. Patients should contact their doctor or call local Poison Control Center in case an overdose is suspected. ZzzQuil overdose in adults and children is a medical emergency that requires immediate attention. Seek immediate medical attention if these side effects are observed. Medicines may be given in order to manage treat symptoms such as changes in blood pressure, treat irregular heart rate and rhythm, control seizures. In case of respiratory depression, oxygen therapy or insertion of a breathing tube may be necessary. Can I take ZzzQuil with alcohol? Mixing ZzzQuil together with alcohol may cause potential side effects and adverse reaction. However, the exact mechanism of this interaction is not fully understood but in theory alcohol may enhance ZzzQuil Central Nervous System depressive effects. Both substances can cause drowsiness and sedation as their most common side effects. These drugs may also impair concentration, focus, memory and thinking. Alcohol can potentiate the effects of ZzzQuil, and vice versa. Toleration to these sedative effects depends from person to person. Some patients can tolerate drinking a glass or two of alcohol very well while they are on ZzzQuil therapy while others may develop mentioned side effects immediately after drinking. That is why patients should avoid taking alcohol while they are on this drug treatment. Patients who operate heavy equipment and machinery or drive are must avoid drinking alcohol because of the possible drowsiness. If they choose to drink alcohol, they should not drive, operate machinery or engage in other activities that require concentration and focus. What happens if I miss ZzzQuil dose? What happens if I overdose ZzzQuil? Where should I keep my ZzzQuil? It has to be kept out of the reach of children. Store at room temperature between 20 and 25 degrees C. Do not freeze. Protect the product from light. Throw away any unused medicine after the expiration date. Some products may contain alcohol or have other flammable components. Do not use while smoking or near heat or flame. Diphenhydramine has been classified in pregnancy category B by the FDA pregnancy category list of drugs. Animal studies have failed to reveal this drug teratogenicity. No relationship was found to large categories of malformations. However, possible relations with individual malformation were found. One study reported that there is a statistically important relationship between diphenhydramine administration in the first trimester during pregnancy and cleft palate. There is also one case of withdrawal in an infant whose mother ingested 150 mg per day of diphenhydramine has been reported. This infant has been developed tremor on the fifth day of life which was treated with phenobarbital. Diphenhydramine is only recommended for use during pregnancy only when benefit outweighs risk. Diphenhydramine has been shown to have oxytocic side effects in animal and human uteri. One case report of a pregnant woman who administrated a large diphenhydramine dose in an attempted suicide developed strong, regular uterine contractions that were halted by the administration of intravenous magnesium. Small doses of diphenhydramine that are used occasionally are not expected to cause any side effects in infants during breastfeeding. However, larger doses and long term use of this drug may cause side effects in the infant or may even decrease the milk supply, particularly if it used together with a sympathomimetic drugs such as pseudoephedrine or before lactation. Single bedtime doses after the last breast-feeding of the day may be suitable for many women and will minimize any side effects of the drug. However, the nonsedating antihistamines are preferred alternatives. ZzzQuil + Other Antihistamines: Use of ZzzQuil together with other antihistamine drugs may increase the risk of side effects. Patients have to avoid taking other antihistamines while they are on ZzzQuil treatment. ZzzQuil + propoxyphene: Using propoxyphene together with ZzzQuil may enhance side effects such as drowsiness, dizziness, confusion, and difficulty concentrating. Some people, especially the elderly, may also experience impairment in thinking, judgment, and motor coordination. You should take propoxyphene exactly as prescribed by your doctor. ZzzQuil + tamoxifen. If it is used on regularly basis or continuously for extended periods of time, ZzzQuil may reduce the effectiveness of tamoxifen in the treatment of breast cancer. The proposed mechanism is probably the inhibition of tamoxifen bioactivation through liver enzyme CYP450 2D6 to metabolite known as endoxifen which is the active metabolite that may be responsible for tamoxifen’s antiestrogenic activity. This is consistent with studies that showed poorer clinical results such as increased breast cancer recurrence; lower rates of event-free survival, shorter relapse-free periods and decreased incidence/severity of hot flashes in patients treated with tamoxifen who have genetic polymorphisms of CYP450 2D6. Patients on tamoxifen therapy should talk with their doctor if they have any questions or concerns. Doctor may be able to prescribe alternative drugs that do not interact. Patients with depression. A variety of abnormal behavior and thoughts changes have been reported and occurred after hypnotics use. Some of these changes include decreased inhibition, agitation, aggressiveness and hallucinations. Anthistamines including diphenhydramine may worsen mental depression and cause suicidal behavior and ideation in critical patients. Patients should be monitored for any changes in mood or behavior. Therapy with this drug should be administered cautiously in patients with a history of depression or other psychiatric disorders. It may be prudent to refrain from dispensing large quantities of medication to these patients. Patients with gastrointestinal obstruction, glaucoma and urinary retention. Antihistamines such as diphenhydramine often have anticholinergic effects, to which elderly patients are particularly sensitive. Therapy with ZzzQuil should be administered carefully, in patients with preexisting health issues that may be exacerbated by anticholinergic activity, such as gastrointestinal obstructive disorders, urinary retention or obstruction; angle-closure glaucoma or untreated intraocular hypertension. Patients with asthma or chronic obstructive pulmonary disease – COPD. It has been proposed that the anticholinergic effect of diphenhydramine may decrease the volume and cause thickening of bronchial secretions, which may result in respiratory tract obstruction. Some health professionals will recommend that therapy with antihistamines have to be administered cautiously in patients with asthma or chronic obstructive pulmonary disease. Patients with Cardiovascular Disease, Hypotension or Hyperthyroidism. Antihistamines such as diphenhydramine may in some not some common cases cause cardiovascular side effects which are related to their anticholinergic and local anesthetic (quinidine-like) effects. Palpitation, ECG changes, arrhythmias, fast heart rate, hypotension, and hypertension have been reported. Although these effects are uncommon and usually limited to overdose situations, health professionals recommend that therapy with antihistamines should be administered cautiously in patients with such issues. Patients with glaucoma and trouble urinating. Some hypnotic drugs such as diphenhydramine have anticholinergic effect and should be used with caution in patients with glaucoma, and trouble urinating due to retention or enlarged prostate.